Well, you can tell by the color of Cam's hair that it's robotics season again. 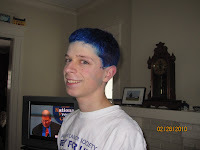 Last night he went to a hair-dyeing party to get just the right shade of royal blue for next week's competition at RIT. Cam has been involved in helping to build "Uncle Ralph," with Fairport FIRST's team 578(Go Blue Lightning!) after school and on weekends since right after Christmas. Even though the build sessions and other obligations have basically eaten up his life (it's not over: Crew is now eating up his life), he has loved it. He's made great friends on the team, and his participation has really sparked an interest in engineering, and has helped him focus a little more on college than he had been before (which provides great relief to his parents). So to answer the two questions you've been "dyeing" to ask: No he is not a descendant of Grandpa Smurf, and no, it won't wash out! Isn't it funny how our lives evolve? Lately I've been thinking about how amazing my journey as an adult and parent has been, how we never stop growing and changing, and how we adapt to all the different stages in our childs' lives. At one point we were dinosaur experts, then we knew all the names of Thomas the Tank Engine's friends. We did all the usual "girl" stuff from dancing to Barbies to (the very expensive) American girls stage. We've watched Cameron learn about engineering during the last couple of years at robotics, kept up with styles and music along Annalisse, learned to ski as the kids learned, and now we know more about rowing than we'll ever want, or need, to. That's usually what I say to my kids from sun up to sun down on their birthdays, as I recount every hour and every highlight of they day they were born. Today, Cam just rolled his eyes with every time I said it, recounting all the exciting events from "17 years ago today." And how did the birthday boy spend his day? He was at robotics from 10-7 putting the finishing touches on "Uncle Ralph," this year's robot for the robotics competition at RIT the first weekend in March. After robotics, we're heading over to Grandma Jeanne's for one of his favorite dinners (Chinese pork spare ribs), then I'm sure when we get home he'll get on his computer and that will be "it" for the rest of the night. Tomorrow he's in robotics all day again, but we'll be going out to one of his fave restaurants, Selena's, for dinner. It's been nagging at me that I haven't yet posted about "our hot new ride," the Honda CRV we got after we decided that we didn't want to deal with the eventual trade-in issues related to the Honda Pilot that was damaged in our December 28th accident. We feared that when it came time to trade the Pilot for another car a couple of years down the line, the Carfax report related to the car would show that it had been in a major accident ($14,000+ worth of damage), and we would have difficulty with the trade-in value or a private sale. Another Reason to Love Fairport - Even in the Winter! I haven't written anything lately about how awesome it is to live in Fairport, so it seems like I'm definitely due. Yesterday, I found yet another reason to love living in Fairport: the Labatt Blue Rochester Pond Hockey Tournament. This past weekend hundreds of players and spectators came out to see teams compete on the Erie Canal, which is right down the street from my house. This is apparently the "Second Annual," and I heard from one of the players that last year's tournament was on Conesus Lake - I hope they'll consider Fairport a "permanent home" since it's so conveniently situated. It's a really cool event in these days of mostly-only skating indoors. What better place for such a tournament than Fairport? The players need only to walk down to the street to a restaurant or pub when they're hungry (or in need of an adult beverage), and I'm sure the area businesses have also benefited from the increased foot traffic this weekend. 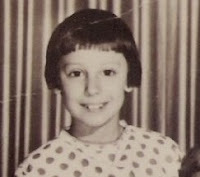 A very happy 50-something birthday to my OLDER sister, Mary, self-proclaimed Queen of the Grecos. May she long reign! !